The obvious effects are easy to spot, if you’ve traveled here in the past. Tour buses saturate the parking lots now, and many attractions even as far as northern Iceland have become saturated with people who get shuttled around to different pavement and walk-up views to sites that previously were not so accessible. Much new land has been broken and paths that were once dirt or gravel have been paved over, or built fresh. Much of this has been due to the destruction caused by heavy foot traffic or heavy vehicles parking off-road, destroying the terrain. As a result of the construction needed to keep up with demand, a number of well known sites have begun charging to cover the cost of maintenance and repairs, or sometimes just to turn a profit. One extreme example of turning a profit off of tourism is the Vestrahorn mountain range in southeastern Iceland. The owner of a small, 1/4 mile gravel road, to which you can glean the best view of the Vestrahorn in Stokksnes, has erected a parking gate literally in the middle of nowhere, where one must walk up and pay 800 kroner at a car-wash like payment kiosk before you can drive down his road to see something that the owner had no hand in building, and doesn’t maintain. When we last visited, the shoreline was cluttered with trash, a plastic gas can sitting in the mud, and other detritus left by tourists. Just a few years ago, this was just an old gravel road with a rock, and the words “pay 300 kroner at bakery” written on it. The old man would come and chase you down if you didn’t pay, as we watched him do with a couple of tourists. Before tourism became such a big thing in Iceland, this was just a gravel road that the occasional photographer could freely walk down, un-accosted. What used to be a photographer’s best kept secret has been turned, by one of the locals, into a big revenue generating selfie attraction, and at least some of the money he makes has gone to advertising in travel magazines. A sadder example of how tourism has changed the lives of locals is Kirkjufell Mountain. The former owners of the land containing Kirkjufellsfoss, a beautiful small waterfall that became an iconic place for photographers, recently sold their property due to the flood of tourists on their land. Only a few years ago, the wife’s eyes would grow big as she talked to us about “my mountain”; she was obviously in love with her land, which had been passed down to them from generations prior. They raised sheep and horses on it, which we got to meet after they invited us up to their farm. When we went back to visit them, they mentioned that they had sold the land because of the flood of tourists walking all over the waterfall, who ultimately destroyed the old dirt paths that my wife and I used to hike. The Icelandic government had to come in and rebuild all of the paths, laying down rugged rubber walkways filled with crushed rock. Some of my favorite paths to the waterfall are now closed. The government also has plans to pave over part of the natural habitat to build a large parking for accommodating all of the tour busses that have destroyed the existing parking lot, which was only built for maybe six cars. The family ended up buying a more private plot of land with another waterfall on it that she now, almost as a cruel irony, refers to as “my waterfall”; I only hope it stays private this time, and that tourists don’t find it. If you’re a first time visitor to Iceland and see all of this, you probably don’t realize that things were very different just years ago, and that Iceland has undergone such noticeable changes because of tourism. They probably think Iceland is a lot like western culture, because they’ve started catering to it. Yet people have sold their farmland, and lives have been changed in many ways as a result of the recent boom in tourism. These aren’t the only people who object to the geographical changes going on, either. The Reykjavik Art Museum recently showed a photography exhibit titled “Importing Scenery” that featured photography of the massive excavation that is needed to create these attractions for tourists. Much of it involves complete destruction of natural habitat, running heavy electrical, significant paving, and sometimes even boring into the natural land. It seems the majority of people who want this kind of change are the tourists, and the banks in Iceland, and notsomuch as many people as you’d think. In addition to the excavation efforts going on around Iceland, there are more subtleties to be observed by those paying attention. One is now likely to see the occasional overturned car off the side of the road, sitting upside down in an old lava bed.. These eye sores have been intentionally left, much like they are during prom in the US, to slow the drivers down, because tourists don’t obey the speed limits or respect most traffic laws. The big problem with speeding in Iceland is that the roads are built over the land, because it’s much more difficult to dig down into the ground, and to prevent frost heaves. Sometimes these roads are 10-20 feet higher than the terrain, and the results are very dangerous for western drivers who aren’t used to this. Tourists fail to take the high winds, slippery roads from rain and ice, and hazards like sheep into account, or simply spend too much time staring at the scenery. Any of these can result in a fatal rollover for someone who is speeding. 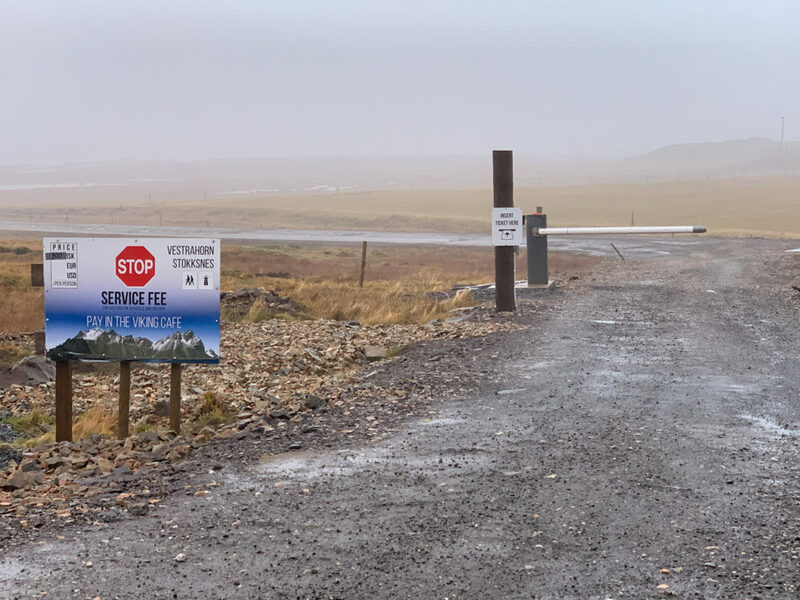 A significant number of pull-offs have also been added, destroying more of the terrain, to try and get tourists to stop pulling off near the edge of the road, which is illegal in Iceland. In spite of these pull-offs, many tourists end up stopping in the road altogether. The dumbest tourists we saw had parked in the road in a 90 k/h area, hanging out the window to take a photo, while another walks across the street to get a photo, leaving the driver door open. We saw this type of thing repeatedly, and it’s highly dangerous to oncoming traffic. To see more of the subtle effects on Iceland, one only needs to read the signs – literally. Not just the many new tacky billboards that have gone up recently, although those are in plentiful numbers, but the smaller signs tell a more familiar story. Among these, you’ll find signs reading “Drones are Forbidden” at almost every attraction. If you ask the locals, its because of inconsiderate drone operators putting people’s safety at risk flying drones in the third windiest place on Earth, and over large crowds. In Iceland, the winds are often so strong that people have a hard time standing, with many gusts blowing cars in all directions on the road. This has caused many drones to hit people, or disrupt nature. 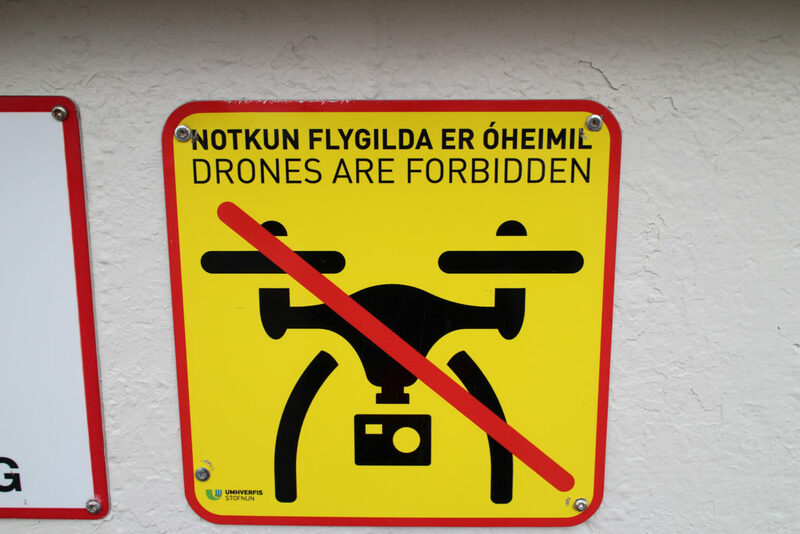 Some drones have been lost into Geysir Strokkur, one of the only geysirs that still works, because too many tourists threw things into the original Geysir to make it erupt (it rarely does anymore). In spite of the signs, there are still plenty of inconsiderate tourists flying drones in restricted areas. Drone signs aren’t the only new signs. Many others obviously have stories behind them too and no doubt have been the result of the same type of rude tourists. Another sign that told a very American story was posted at breakfast at a hotel we’ve frequented: a sign reminding visitors that the free breakfast buffet doesn’t, in fact, mean you can stuff a box full of free food for lunch and dinner later on so that you don’t have to pay for any meals. Signs telling people things that no person should ever have to be told. Other signs are meant to be less of a deterrent and more of a reminder of values many have forgotten: “No WiFi, Talk to Each Other”, at local restaurants, as one glaring example of the differences in the two cultures. In terms of food, the overall cuisine has seen some subtle changes as well. B&Bs that used to serve skyr, a thousand year old heritage in Iceland, have switched to yogurt, because tourists request it so often and too much of the skyr has gone to waste. There are fewer loaves of fresh baked bread to be found. Bread has gone either white or pre-sliced. Restaurants have adopted a more western fare, with more burgers and fries than traditional Icelandic meals. Much of the cuisine has also become slightly more dull and bland, to cater to an international crowd that isn’t used to spices like cumin and caraway, or sheep-dung smoked meats, salts, or other forms of local cuisine. If I had to summarize what happened to the food, it’s beginning to show signs of losing its culture. Subtle effects in the local economies are also noticeable. Many shoppes that used to sell hand-made goods have now transitioned to selling tourist junk, like shot glasses and toy vikings, due to tourist demand, meaning local artisans are not getting the business they used to. Wool sweaters are the only old world product that seems to remain, and now shoppes are saturated with them to the degree that their designs have departed traditional Icelandic design to adopt more western ones. We even found a sweater with purple unicorns on it. The economics in Iceland have changed dramatically and has obviously enjoyed a significant boost, making its prior crash only a bad memory. But what used to be a fishing and farming economy has now become heavily embedded in tourism, which can be volatile over the long term. Even local communities have formed a dependence on tourism that is now beginning to wind down, and this has become a wakeup call to the banks. Rumors around Iceland (and the rest of the world) are that WOW Airlines is going to go bankrupt. This will cause the country’s GDP to shrink roughly 3% and the Kroner to lose massive value (15-20% potentially). From one cut rate airline going under. Apparently the banks are so heavily invested in tourism that they fear this will cause a domino affect, causing the already struggling IcelandAir Hotel chain to also go bankrupt, leading to another economic crash. Over just the past 2-3 years, we’ve seen a large number of new guesthouses and hotel chains build out that didn’t exist prior to. A chain of Fosshotels, which are Iceland’s version of a Ramada Inn, have gone up in small towns across Iceland that were otherwise untouched by industry. Building structures are now judged by what’s on the outside, rather than what’s on the inside, as western tourists are used to. Because tourists were too entitled to book at older B&B where they might have to share a bathroom, or stay in a building that is older than their own home country, many of the more historic inns and B&Bs have since closed, and the Ramada Inns are where tourists now stay in order to see “raw, untouched Iceland”. Hotels, airlines, new guesthouses, a new infrastructure – all of this is tied to debt owned by banks that have seemingly gotten themselves over-invested in tourism. This debt all hinges on the tourism economy continuing to grow at unprecedented rates. Tourism has no doubt left its scent on Iceland, and as someone who’s grown to love the Icelandic people and appreciate their way of life, it’s discouraging to see the people change their way of life to accommodate tourists who don’t know how to respect, appreciate, or even function in a society different from their own. Some might see this as a big win for economic progress, but I find it hard to celebrate taking such a special and unique country and turning them into yet another western culture, much like the US did to Hawaii. Economic dependence on tourism leads nowhere good, and ultimately one of two things are likely to happen: either the tourism economy will crash and the country will correct itself, or the tourism industry will continue to grow so grossly that you won’t be able to even recognize Iceland or its culture anymore. The best way to rectify this is to stop visiting Iceland and let the tourism economy die down to some normal levels. This seems to be just starting to happen, although what happens long term over the next 5-10 years is anyone’s guess. I would recommend leaving Iceland off your vacation list for five years, and see if the country begins to get back to its roots. Visitor counts are published annually. This is probably a good gauge of how touristy Iceland is in a given year. For those who must go, ( and when in any foreign country,) please let us all learn how to be a better tourist. The rest of the world isn’t like the west, and doesn’t want to be. That’s one of the things that makes places like this so special. The history of the Scandinavian people goes back long before the “west” was even a thing. Before America existed, when the only “west” was Europe. In spite of popular nomenclature, Scandinavia isn’t Europe. Much of being a good tourist boils down to common sense and values that more and more seem to have not been raised with, but should learn. When one visits a place, don’t expect to be served like you are at home, or expect society to conform to your expectations. It’s you, the visitor, who are a guest in someone else’s world, and should learn to adapt to the culture you’re in. Do all that you can to respect and help preserve other people’s way of life wherever you go. Visit with a sense of openness to learning a different culture, rather than taking your culture with you. Learn how to let a foreign culture rub off on you, rather than the other way around. You’re the foreigner when you’re in Iceland, and the Icelanders have enjoyed a certain way of life for over a thousand years (as old as their skyr recipes). The last thing they need is western civilization coming in and thinking Icelanders should be more like us. If you want to help Iceland’s economy, don’t give your money to the tourist traps, like the Blue Lagoon, which is entirely artificial, or to chain hotels instead of the small inns and B&Bs they’re stamping out. When you shop, don’t give your money to stores that have started selling tourist junk. If they’re selling shot glasses and Northern Lights books, that means they’re also not selling the smaller hand-made things from local artisans. Wool sweaters are “the thing” now everywhere, but seek out a shoppe that has the little hand-made Christmas ornaments or trinkets, local photography, and items a local would want to buy – that’s the kind of shoppe that’s supporting the local crafters.. If you want an authentic hand-made Icelandic wool sweater, you can find one on most farms, rather than the machine-made big label stuff that’s out there. In short, give your money to small, local businesses that haven’t started catering to tourists. And for goodness sake, stop paying to see the sites, and instead visit the many that a re still free. It wouldn’t kill anybody to learn a little Icelandic either. Pimsleur now has an Icelandic 1 series, available as an audio book. It also wouldn’t kill anyone to learn about the Icelandic culture, and develop a respect for their land and way of life. At least learn how to say things like Eigðu góðan dag, takk fyrir, and sömuleiðis, and approach Icelanders with a sense of gratitude and respect rather than expecting them to serve you. They were there long before us.